Not for sale to customers living in Australia and New Zealand. These countries have their own distributors. Hand lines and wrinkles can be caused by sun damage, ageing and lack of hand care. The Wrinkles Schminkles Hand Smoothing Pads are made from 100% Medical Grade Silicone proven to smooth out hand wrinkles and improve the skin's texture. Apply while you sleep or at anytime throughout the day. Rinse the pads under lukewarm water every few uses but to prolong the life of the pads we recommend the Wrinkles Schminkles Cleaning Solution to remove the build up of dead skin cells, body oils and dust particles that may occur on the pads. The silicone pads will begin to lose their adhesiveness after 20-40 uses depending on your skin type and how well they are cared for. Kit contains: 2x Reusable Hand Silicone Pads that can be trimmed with scissors to best fit the back of your hands. Reusable 20-30 uses - can last longer using the Wrinkles Schminkles Cleaning Solution. Hypo-allergenic. Improves the skin's texture. Easy to use. Step 1. Applying, simply wash and dry your skin thoroughly – keeping it free of moisturisers and creams. Peel the plastic film from the Wrinkles Schminkles Silicone hand Pad and apply to your hand with the self-adhesive side down. Step 2. Cleaning: Wrinkles Schminkles Silicone hand Pads are re-usable but they will begin to lose their adhesiveness after 20-30 uses. When you clean them with our specially-formulated Wrinkles Schminkles Cleaning Solution you give them new life – ready to be used again and again (and again). Step 3. 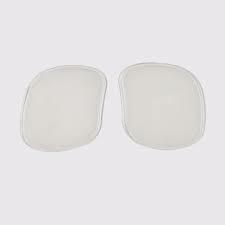 Storing: In the morning, gently peel the Silicone Pad off and stick it, face-down, on the plastic packaging it came in.